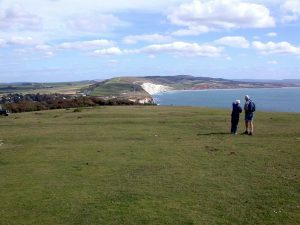 Join Rebecca Loader (Senior Archaeologist with IOW Council) and Rosie Lansley (Archaeological Officer with IOW Council) for a walk from Freshwater Bay to the Needles, passing prehistoric earthworks including a Neolithic Mortuary Enclosure, Bronze Age Barrows, and large enclosure recently excavated by CITiZAN, 19th century fortifications, WWI anti-landing trenches and Black Knight rocket testing site, ending up at the teashop at the Needles Old Battery. A short walk to Alum Bay will pick up the bus back to Yarmouth. This walk is approximately 4 miles / 3 hours. Information for mainlanders on how to get to Yarmouth and Freshwater Bay will be made available nearer the time.